PvT data (Pressure, Volume, Temperature), describes the way in which the specific volume of a material varies with pressure and temperature. 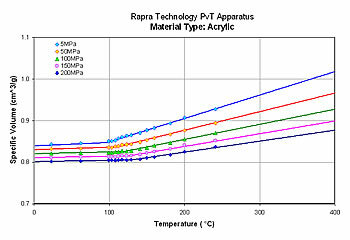 Specific volume can change significantly at the high temperatures and pressures encountered during processes such as the injection moulding of polymers and is a dominating factor in the packing & cooling phase of the moulding cycle. PvT information is essential in flow simulation software for accurate prediction of shrinkage & warpage. 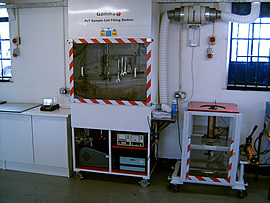 Gammadot measure PvT behaviour using a high pressure dilatometer system developed by Rapra Technology Ltd. 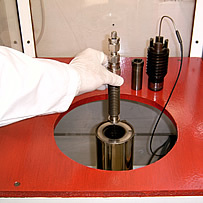 The technique employs a stainless steel bellows test cell with Mercury as the containing fluid, Figure 1. Volume changes related to changes in temperature & pressure are monitored via a displacement tranducer. Use of a containing fluid enables samples to be characterised in solid & liquid form. The test cell is surrounded by oil within a sealed pressure vessel, Figure 2. 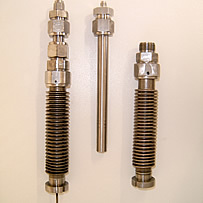 Measurements can be made over a range of temperatures (23°C to 420°C) and pressures (5 MPa to 200MPa). The family of curves derived from testing are fitted to mathematical models to provide the coefficients required by flow simulation software packages such as Moldflow and Sigmasoft 3D. We have experience in characterising a wide variety of materials including many types of semi-crystalline & amorphous thermoplastics, uncured & cured elastomer (NR, EPDM, FKM, VMQ, SBR, NBR, etc), detergents, ceramics, and uncured & cured thermosets (epoxy resins, EMC, SMC, DMC, Phenolics, etc) to name a few.